Here I am back again from the MIC’06 conference in Koper (Slovenia) where I presented my article Communication in a Virtual Classroom (read the abstract). 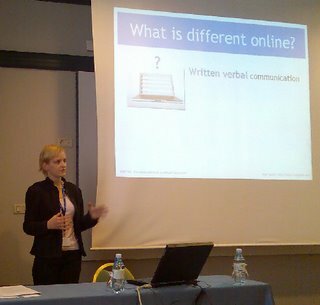 The conference was focused on management and business topics, but there was also an e-learning section. There weren’t many papers in that section, so I didn’t really attend to many of the presentations. But of the presentations I did attend, I most enjoyed Alex Koohang’s presentation of his paper In Search of a Learner-Centered Instructional Model for Blended Learning in which he presented his blended learning model (in this context blended means half face-to-face and half online learning) and some of the constructivist methods he uses with his students. And although our students come from a different background, I think that they could benefit from the methods that Alex mentioned. I really liked the idea of students writing short essays with their reactions to some material and then having to read, comment, analyze and react to essays written by their pears. That’s really constructivism in action! I will be posting the link to my and other interesting full articles from the conference as soon as they are available online. But for now here’s my conference presentation. For any additional information about my paper or the presentation feel free to contact me!